In the U.S., the distribution transformer is effectively lightning-proof when protected by a tank-mounted metal-oxide varistor (MOV) arrester. Even if the arrester fails, the transformer will have been protected in the arresters last action. In the U.S., the power transformers found in substations are effectively lightning- and switching surge–proof and have been so for many years. The distribution and transmission lines are the only parts of the modern electrical power system that still need more lightning protection to make them lightning-proof. This paper focuses on the methods currently available to distribution line designers that are already being used in many locations around the country. In the U.S., we deal with lighting every day of the year. According to the National Severe Storm Laboratory, there are approximately 6 million strikes per year across the country. We know from the numerous methods used to monitor strikes that the number of strikes seen in the U.S. varies by location. There are some locations, such as Southern California, where lightning is a rare event; in other areas, such as Tampa, Florida, the ground flash density is as much as 14 per square km per year. Buildings, electrical power systems, towers, and people are all subject to lightning strikes. 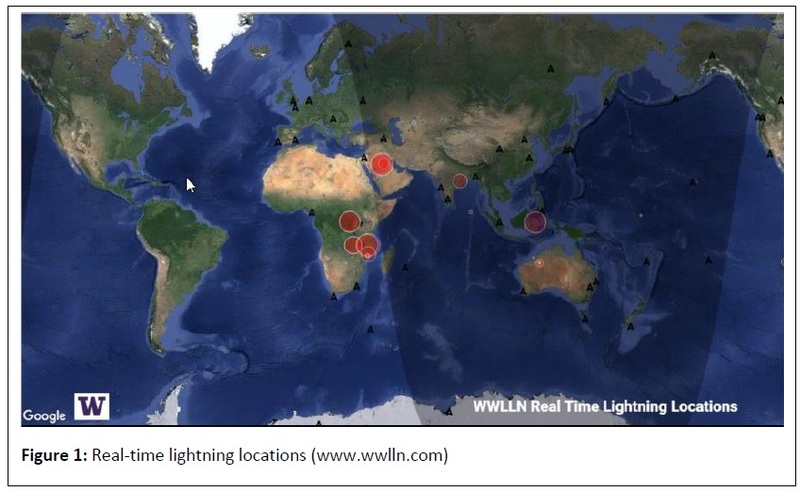 The map below, from the World Wide Lightning Location Network, shows lightning strikes around the world in real time. On the day of this writing in February 2016, the lighting events at 10:00 a.m. EST were located in Africa and Asia. is the cloud-to-ground events that hit near outage. Outages are caused when an insulator flashes over, either in a forward or backward direction from a lightning surge, and is then followed by an arc of the power system current. The power system current is the real issue. A fault on the distribution system requires a breaker to operate to clear and end the event. This breaker operation is what we see as a flickering of the lights when a storm is passing through. This IEEE guide has been in publication since the 1990s and has been updated numerous times. 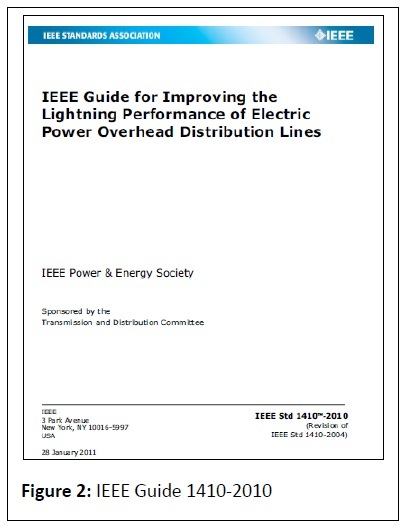 It is the foremost and most comprehensive guide to updating and improving distribution lines from the effects of lightning. The guide can be purchased at the IEEE Standards Store. It can be a distribution system designer’s best friend when it comes to lightning mitigation options. According to the guide, lightning is a major cause of faults on typical overhead distribution lines. These faults may cause momentary or permanent interruptions on distribution circuits. Power-quality concerns have created more interest in lightning and improving lightning protection of overhead distribution lines against faults. The use of arresters is being considered more often as a way of reducing the number of momentary interruptions and voltage sags. It goes on to say that lightning usually causes temporary faults on overhead distribution lines. If the fault is cleared by a breaker or a recloser, the circuit may be successfully reclosed. In the past, this was acceptable—but now, with the proliferation of sensitive loads, momentary interruptions are a major concern. Lightning may also cause permanent faults. Five to ten percent of lightning-caused faults are thought to cause permanent damage to equipment. Momentary faults may also cause permanent interruptions if the fault is cleared by a one-shot protective device, such as a fuse. 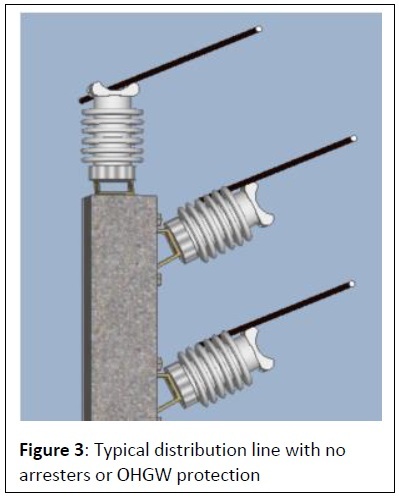 Estimates of the lightning performance of distribution lines contain many uncertainties. 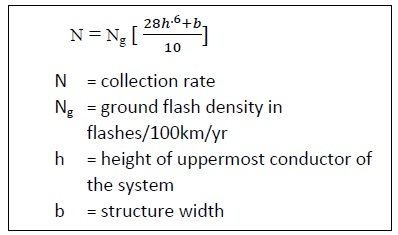 Some of the basics, such as lightning intensity measured by ground flash density (GFD) or estimating the number of direct strokes to a distribution line, may have significant errors. Often, rough estimates or generally accepted practices are as effective as detailed calculations. The guide is intended to provide estimates of lightning-caused faults linked to physical variables such as the line height, presence of parallel neutral or overhead ground wires (OHGW), intervals between ground electrodes and/or surge protective devices, proximity of the line to nearby objects, and characteristics of the soil. The main objective of the guide is to offer simple and easy methods of estimating the number of lightning-caused faults and showing the effectiveness of the various improvement methods. There are two other equations that account for structures that are nearby and effectively shield the system from direct strikes. This is often the case for houses and trees. 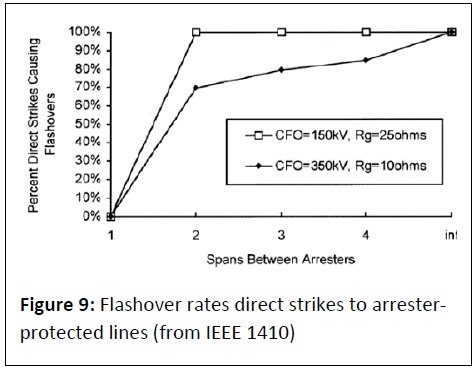 The flashover (FO) rate of the insulators on a line that are directly struck is estimated to be 99% per IEEE 1410. This means that if a line is struck by lightning the critical flashover voltage (CFO) or basic insulation level (BIL) of the insulator does not matter; it will flashover. It is the surge impedance of the line, along with the lightning current, that develops the high voltage on the line. If a 300-ohm surge impedance has 10,000 amps forced through it by a lightning strike, the voltage on the line will be 300 x 10,000, or 3 million volts. If the distribution line had 3 million–volt CFO insulators, then the line may not flashover; but, since an insulator of this magnitude CFO does not exist, we have essentially a 100-percent flashover rate for direct strikes. If a strike lands near the line but not on the line, then there is a possibility that the line will not flashover. 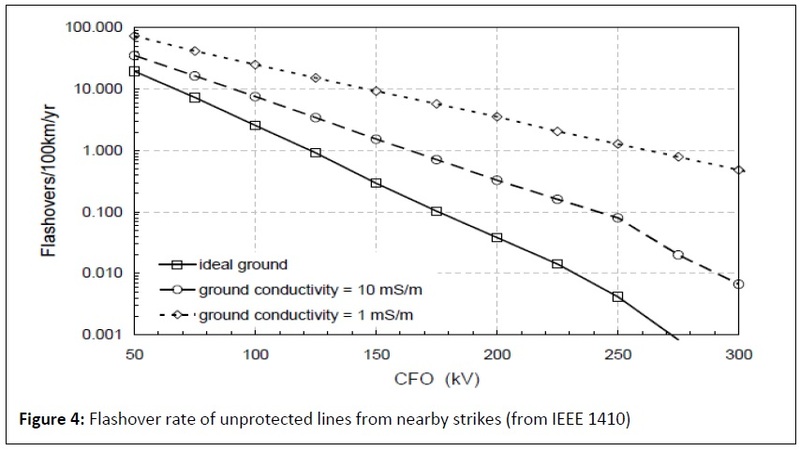 The graph in figure 4 from Guide 1410 indicates the probability of FO for a GFD of 1, a 10-meter pole, and varying distances to the flash. We can see that, for 100kV CFO system, the flashover rate can be from 5–50 FO/100km/yr depending on the ground conductivity. This can be many times higher than the direct strike rate. If your goal is to increase the reliability of your system and this is your current configuration, there is plenty of opportunity here. 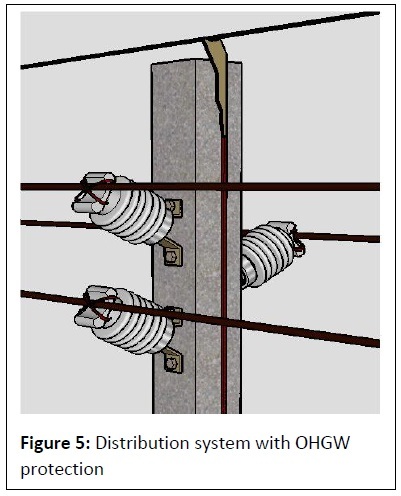 OHGW are grounded conductors placed above the phase conductors, as shown in figure 5, to intercept lightning strokes that would otherwise terminate on the phases. With this system, the lightning current is diverted to ground through pole ground leads near the flash termination. Effectiveness of OHGW requires that they be grounded at every pole. a sufficient shield angle is used to protect the phases (45° or less). difference between the ground lead and the phase conductors. The voltage difference may cause a back flashover across the insulation from the ground lead to one of the phase conductors. 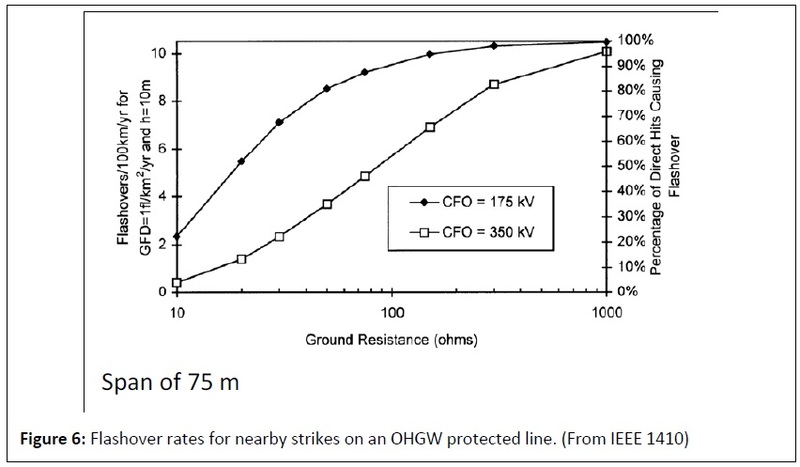 As it is shown in figure 6, an OHGW is effective for many cases, but even with a 350 CFO and 20 ohms of ground resistance there is still a 10-percent chance of backflash and an outage. Modern-day surge arresters manufactured with polymer housings have become the product of choice for protecting distribution lines. The reason for their popularity is that they are inexpensive to purchase and install, they do not need an outage for installation, they have a proven record of high reliability, and they effectively protect the lines when installed in the proper locations. Figure 7 shows one popular configuration. Reliability of arresters has been called into question in the past. However, since the introduction of the MOV arrester 30 years ago, the failure rate of these devices hovers at .02 percent or lower, as reported by quality manufactures of the device. This translates to about one failure every 11 years on a 10-mile line. The mitigation effect an arrester can have on outage rate ranges from none to 100 percent. 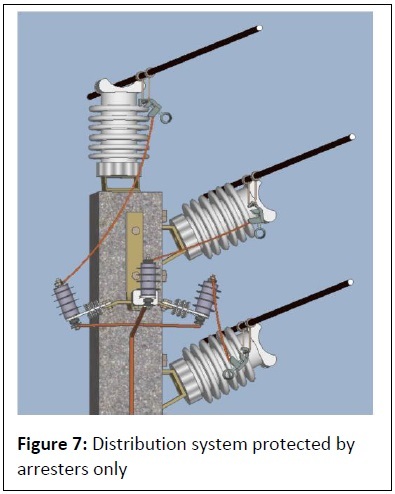 Figures 8 and 9 show how arresters affect the outage rate for various arrester densities. 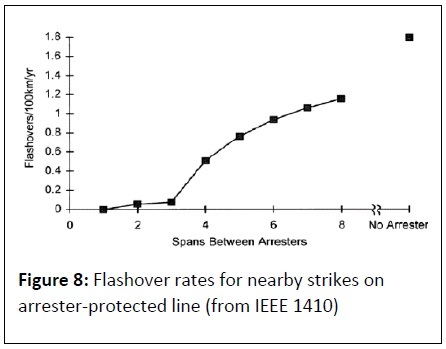 What these two graphs show us is that for direct strikes, if arresters are installed in each phase of each pole, there will be a zero outage rate. This is also independent of the ground resistance of the pole, but as soon as the arrester installations are separated by one or more poles, outages can occur. where one side is lightning-proof and the other is not. There are several ways to protect distribution lines from the effects of lightning. 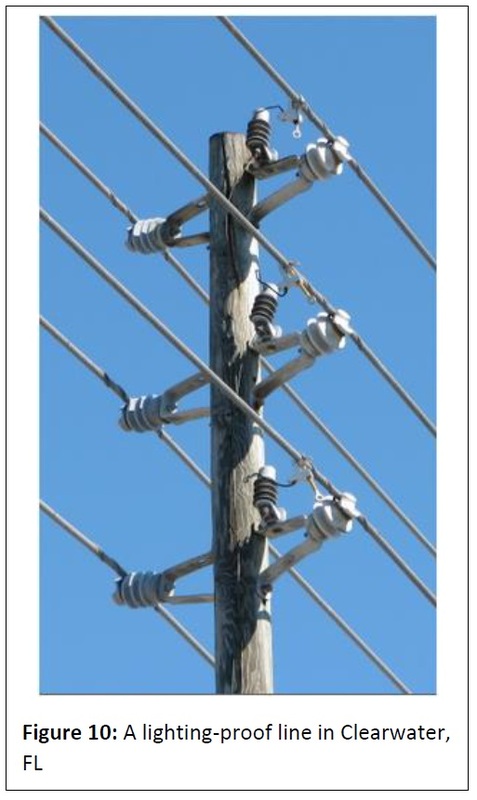 IEEE Guide 1410 offers many suggestions on how to improve line performance with and without arresters. It is quite possible to achieve a lightning-proof line if arresters are used. The use of OHGW helps, but cannot quite be 100-percent effective without the assistance of arresters. This article has been sponsored by members of NEMA Section 8LA.